Summary: How to estimate home construction costs in Northern California. 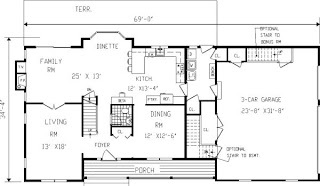 This is an excellent home plan to use to discover the cost to build a home in the Sacramento CA area. Exquisite windows, charming gables and an inviting porch front this warm, thoughtful family home. Inside, choose between formal affairs and casual get-togethers. The living and dining rooms are ideal for entertaining, while the open areas are great family spots. 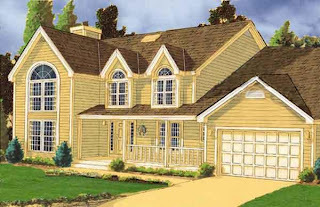 Four bedrooms, including the master suite are on the upper floor. 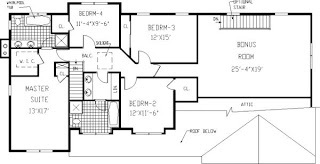 Square Footage: 3,171 sq. ft.
First Floor: 1,488 sq. ft.
Second Floor: 1,683 sq. ft.
Attic: 480 square feet of unfinished attic area with 60 inch to 78 inch headroom. Foundation: Unfinished Basement: 1556 sq. ft.
Central ducted heating and cooling. 1 each insulated prefab metal fireplace, brick face. To estimate building costs, I’ll use the cost estimating software, also called a cost to build calculator, that is found on my Getting Started page. I’ll use Quality Class 5 (Average Standard) throughout the process. Using this foundation shape on the cost to build calculator for the Sacramento, CA area, I came up with $371,006 including a General Contractor markup of $42,356. That’s approximately $117 per sq. ft.
Again, the estimate for this house is an approximate one based on “average standard” quality materials. Important: Cost estimates change with time. YOU can update this 2018 estimate to see if it has, as well as experimenting with different building quality inputs that affect the cost to build. Note: Land, land development costs, impact fees, if any, and any other local fees, are NOT included in any of the estimated costs to build that I provide.